Showing results for tags 'twilight sparkle'. 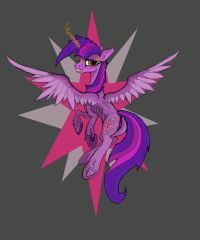 rp interest Twilight Sparkle NEEDS You To Join The TWILIGHT GUARD! Princess Twilight Sparkle is looking for creatures small and large who are willing to defend Ponyville! She is not just looking for those who can march around in armor and look really good doing so, she also wants creatures with smarts! Creatures who are brave! Creatures who are willing to put everything on the line to keep the citizens of Ponyville safe! Those who sign up here will be on her list in the RP. Please give us a good reason why your character would want to join. It would make sense for your character to be a citizen of Ponyville, but that's not mandatory. But you'd probably want to move here once you join. Coffee, Tea and sweets from Sugar Cube Corner will be served. See Captain Fire Walker or Princess Twilight at the 'Castle Of Friendship' for more information! Never under any circumstances should you ever trust a spell to be safe if it says it in bold print on the top of the page. So I'm a bit of a connoisseur of canons. I know there are a lot of ponies out there who probably want a mane (hah!) character within their thread, so this is an offer for me to put one in there for you if you want it! Fellow cast members as well as OCs are both welcome! You can even request that I join a thread you've already got going and you've got a discrepancy in characters, if you'd like. Characters currently available for me to play: Rainbow Dash Scootaloo Twilight Sparkle (Note: There are canons that I plan on applying for that I have not gotten around to applying for yet. This list will be updated, and I will post in this thread, when I have officially applied as those characters, so feel free to check back if the character you'd like isn't here!) Of course, rather than giving absolutely no guidelines for what to request, I'm going to be specific about the kinds of things I will play. I can play, with discussion: Slice of Life, ordinary stuff Hurt/comfort Action-oriented (some details may need to be cemented first in more action-packed threads) Group and 1x1 Long sprawling plots and character development Humorous and silly stuff Long and descriptive stuff Horror (obviously within the site's limits, of course) Things I will only play with fellow canons: Romance (sorry, not big on OCs x canons) Pre-established relationships Things I will not play at all: Anything that breaks the guidelines of the site I'm...pretty much open to anything else, honestly. My wishlist/idea log: Here's where I sheepishly admit that I'm a massive TwiDash fan, and I'll happily accept anything related to it. Scootalove is great. I love Scootaloo and Rainbow as sisters. This will always get a plus from me. Definitely want a big actiony plot at some point. Big adventureeee. Feel free to suggest anything you'd like! No idea is too outlandish, and if I'm not into it the worst that will happen is that I say no or suggest a similar alternative, so go right ahead! Don't be shy! And remember, I am OC friendly, so feel free to throw your OCs at me. Seriously, I'm totally cool with it. Hi guys, it's been awhile! This was done on my phone using an app called PaperOne, which is why the resolution isn't as high as my Photoshop\Fire Alpaca paintings. Which Mane 6 pony is fastest? Have what it takes to be an elite flyer!? Another week and another episode with the ponies we all adore and love! After a decently long hiatus we return to the main theme of last season: Solving Friendship Problems! This time Dash and twilight are called by the cutie map to visit the Wonderbolt Academy to solve a shippingfriendship problem. (Trust me, you all about to see a new ship launch). Well they be able to fix whatever problem is there between two friends among the clouds with a combination of awesomeness and nerdiness? Tune in to find out! The episode airs Saturday 11:30 AM EST on October 15th!! This thread is dedicated to discussing the episode before, during, and afterwards. As the thread is now open it may indeed contain spoilers. I ask that potential spoilers talked about or shown before the episode airs stay within the spoiler tags please, after the episode you no longer have to use the spoiler tags, but warning, if you haven't seen the episode yet after it airs, this thread no doubt will have all sorts of spoilers in reviews, images, etc. So tread at your own risk. 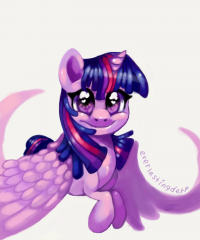 Didn't know what to add, so here's Twilight being adorkable! Another week and another episode with the ponies we all adore and love! You know what Friendship Is Magic was missing? A Rashomon episode! Well now it looks like after six seasons we have one! Yay? Well, in this instance we have three different ponies with three different interpretations of events, can the Princess of Dorkdom work out the clues to find out what really happened? Tune in to find out! The episode airs Saturday 11:30 AM EST on October 1st!! This thread is dedicated to discussing the episode before, during, and afterwards. As the thread is now open it may indeed contain spoilers. I ask that potential spoilers talked about or shown before the episode airs stay within the spoiler tags please, after the episode you no longer have to use the spoiler tags, but warning, if you haven't seen the episode yet after it airs, this thread no doubt will have all sorts of spoilers in reviews, images, etc. So tread at your own risk. Steam Bath! Another week and another episode with the adorable ponies we all love! Yeehaw! It is time for our first Applejack episode of the season, hurrah for best pony! So how will Applejack handle being away from the farm and trying to relax at the spa? How much implied Rarijack shipping is in this episode and how far will the fandom take it? Tune in to find out! The episode airs Saturday 11:30 AM EST on May 28th! This thread is dedicated to discussing the episode before, during, and afterwards. As the thread is now open it may indeed contain spoilers. I ask that potential spoilers talked about or shown before the episode airs stay within the spoiler tags please, after the episode you no longer have to use the spoiler tags, but warning, if you haven't seen the episode yet after it airs, this thread no doubt will have all sorts of spoilers in reviews, images, etc. So tread at your own risk. Best Unicorn! Was there any doubt? Another week and another episode with the adorable ponies we all love! This time Starlight Glimmer, Twilight's first student of friendship has finally made a new friend. A great and powerful friend! How will Twilight react to her faithful student's taste in ponies? Will there be a new battle as an old (and of course, stunning) nemesis returns? Who is the most powerful unicorn now Twilight is an alicorn? Tune in to find out! The episode airs Saturday 11:30 AM EST on April 30th! This thread is dedicated to discussing the episode before, during, and afterwards. As the thread is now open it may indeed contain spoilers. I ask that potential spoilers talked about or shown before the episode airs stay within the spoiler tags please, after the episode you no longer have to use the spoiler tags, but warning, if you haven't seen the episode yet after it airs, this thread no doubt will have all sorts of spoilers in reviews, images, etc. So tread at your own risk. Another week and another episode with the adorable ponies we all love, well, sort of, as this week's episode will be on Twilight's faithful assistant, Spike. Now we all know Spike episodes are controversial (as controversial as one can be about a cartoon about adorable, pastel colored magical ponies), as Spike is often handed (or perhaps hoofed) the idiot ball in them, but hey we know the little guy really does have what it takes to be a great character, so perhaps this will be a defining episode for him! Tune in to find out! The episode airs Saturday 11:30 AM EST on April 16th! This thread is dedicated to discussing the episode before, during, and afterwards. As the thread is now open it may indeed contain spoilers. I ask that potential spoilers talked about or shown before the episode airs stay within the spoiler tags please, after the episode you no longer have to use the spoiler tags, but warning, if you haven't seen the episode yet after it airs, this thread no doubt will have all sorts of spoilers in reviews, images, etc. So tread at your own risk. 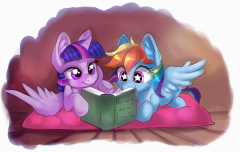 I was recently watching a lot of Twilight/Rainbow episodes and I gotta say I really love their chemistry, and the fact that they bond over books is just too adorable. I couldn't help but draw these two little eggheads. Just a 1920 x 1080 (16:9 ration) Desktop sized version of the banner pic. Soon... All of Equestria, and then the world! ¡Viva la Revolución! ¡Viva la Igualdad!! This is it, the one hour finale for season 5! We all know who is returning, but what does she plan to do this time? How will our favorite communist revolutionary change all of Equestria and remove the mane six from her, well, mane, for all time? Will she own all the cutie marks? Will she be reformed? Will she be a reoccurring villain? Will she write a little red book? Will this be a cliffhanger and you all have to wait a half year for a conclusion?? Mwhahaha! Tune in to find out! The episode airs Saturday 11:00 AM EST (that's a half hour early!!) on November 28th! This thread is dedicated to discussing the episode before, during, and afterwards. As the thread is now open it may indeed contain spoilers. I ask that potential spoilers talked about or shown before the episode airs stay within the spoiler tags please, after the episode you no longer have to use the spoiler tags, but warning, if you haven't seen the episode yet after it airs, this thread no doubt will have all sorts of spoilers in reviews, images, etc. So tread at your own risk. Twilight Sparkle if she were an EEEEVIL Lich! xD The subtle not so over the top version of said Evil Lichdom is still very pretty and snuggly! The challenge was to find a Fluttershy-Twilight pic that wasn't an obvious ship pic. Well we had our Dash and Pinkie ship friendship adventure and our Rarity and Applejack ship friendship adventure, so now finally it is Fluttershy and Twilight's turn to be shipped, I mean go on an adventure! Did you know FlutterTwi was a thing? I did not until I tried search for a picture of the two of them together. Anyway this week's adventure deals with two feuding pony families! How many Appalachian stereotypes will we see? Will there be shipping fuel? A new beloved one shot character? Tune in to find out! The episode airs Saturday 11:30 AM EST on November 14th! This thread is dedicated to discussing the episode before, during, and afterwards. As the thread is now open it may indeed contain spoilers. I ask that potential spoilers talked about or shown before the episode airs stay within the spoiler tags please, after the episode you no longer have to use the spoiler tags, but warning, if you haven't seen the episode yet after it airs, this thread no doubt will have all sorts of spoilers in reviews, images, etc. So tread at your own risk. Official Discussion Thread - S05E22 What About Discord? Could have an explanation for this, but nahhhhh! It is the return for everypony's favorite trollfriend, Discord! Oh c'mon, you know he is happier now that he has discovered friendship as he has discovered he can so completely troll his friends and not get into so much trouble! So what mischief is QDiscord going to cause this time for the Princess of Friendship? Tune in to find out! The episode airs Saturday 11:30 AM EST on November 7th! This thread is dedicated to discussing the episode before, during, and afterwards. As the thread is now open it may indeed contain spoilers. I ask that potential spoilers talked about or shown before the episode airs stay within the spoiler tags please, after the episode you no longer have to use the spoiler tags, but warning, if you haven't seen the episode yet after it airs, this thread no doubt will have all sorts of spoilers in reviews, images, etc. So tread at your own risk. The squeal to this image. It is June 28th, which is the far less known Tau Day (as Tau equals 2π or 6.28). 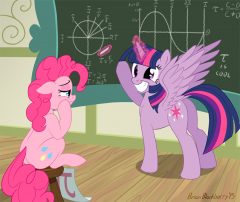 Well twilight is a devotee of the Tau Manifesto and feel the need to explain to (a very bored) Pinkie Pie why she feels Tau is superior when it comes to the geometry of circles and other math. Thus another silly math joke. You all just want to see more Sunset Shimmer, admit it! In addition to having a new episode today, we will also have the television premiere of Equestria Girls - Friendship Games! In the third EQG movie, Canterlot High, home to our heroines, is set to face off against its rival school Crystal Prep Academy, while Sunset Shimmer deals with her homesickness for the magic of Equestria, meanwhile Crystal Prep brings with them a familiar face, that world's Twilight! What happens? Tune in to find out! The movie airs Saturday 7:00 PM EST on September 26th! This thread is dedicated to discussing the movie before, during, and afterwards. As the thread is now open it may indeed contain spoilers. I ask that potential spoilers talked about or shown before the episode airs stay within the spoiler tags please, after the episode you no longer have to use the spoiler tags, but warning, if you haven't seen the episode yet after it airs, this thread no doubt will have all sorts of spoilers in reviews, images, etc. So tread at your own risk.